Be the first to share your favorite memory, photo or story of Shanika. This memorial page is dedicated for family, friends and future generations to celebrate the life of their loved one. Shanika Sheri Jones, affectionately known by her friends as “Angel”, daughter of Yvette O. and Rev. Willie A. Jones Jr. was born November 20, 1987 and departed this life on Thursday, January 3, 2019. She was raised in a military environment where she traveled throughout the United States and Europe with her family. After High School, she left for Memphis chasing her dreams. She lived in Memphis Tennessee for the last thirteen years, where she passed away. Shanika loved her family and called regularly to stay in touch. No matter where her parents were, Shanika would call and ask, “Where are you and what are you doing?” She had a warm and playful disposition for others and a great fondness for her dogs, and the Miami Dolphins. Her life was short, but she made an impact on her mother, father, family and numerous friends. She was outgoing, smart, funny and witty. Shanika just loved having fun. She had a warm kind spirit, yet she was troubled at times. She would love deeply but hurt easily. She is at rest now and her earthly journey has ended, but memories of her dazzling smile, witted comments and conversations will forever live on in the recesses of the minds and hearts of those she touched. 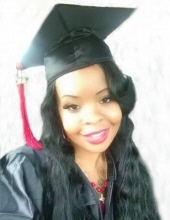 Shanika leaves to cherish her memories: her father, Willie A. Jones Jr. and her dear mother, Yvette O. Jones of Chester, VA; her big sister, Ebony N. Jones of Roanoke, VA; two nephews, Joshua J. Jones and Jeremiah D. Jones of Roanoke, VA; Grandmothers, Penola A. Fields of Newark, DE and Mary S. Jones of Burkeville, VA; many aunts, uncles, great aunts, great uncles, numerous cousins and friends. Funeral Services Saturday, January 12, 2019 at 12:00 noon at Fourth Mt. Zion Baptist Church, Crewe. Interment Bland, Jackson, Green Cemetery, Crewe. To plant a tree in memory of Shanika Sheri Jones, please visit our Tribute Store. "Email Address" would like to share the life celebration of Shanika Sheri Jones. Click on the "link" to go to share a favorite memory or leave a condolence message for the family.